Richard Hartley, who wrote River of Steel, expands on the Worthington pump’s definitive name in his history of the Goldfields and Agricultural Water Supply 1903 – 2003. He gives James Simpson & Co. Ltd’s History of the Coolgardie Water Supply Scheme, London 1904 pp 18-19 as his reference. Each of the twenty pumps provided by James Simpson & Co. Ltd of London for the Coolgardie Water Supply Scheme was given this description by its supplier. The pump was termed horizontal because the main pump mechanisms worked in the horizontal plane; triple expansion because the steam provided to the engine was made to expand and do work three times, first in the high pressure (HP) cylinder, then in the intermediate (IP) cylinder and then in the low pressure (LP) cylinder. The pump was termed duplex because each pump actually consisted to two parallel pumps, which shared a joint water inlet from the pumping station tank and a joint outlet to the pipeline leading to the next pumping station. The two parallel pumps were synchronised so that only one of the two delivered at any one time to provide as uniform a flow as possible, The pumps were direct acting because the pistons in the three cylinders were interconnected with the pump plunger via a crosshead so the pistons and plunger worked in unison. 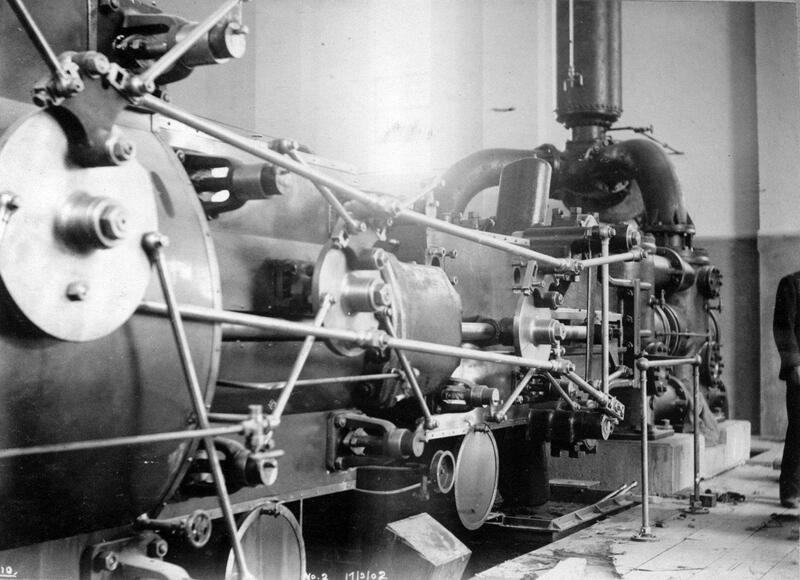 The pump was described as high duty because it incorporated a number of devices intended to ensure that as much energy was extracted from the steam as possible. This was because Collie coal was the fuel which was originally intended to fuel the boilers. Because the coal was not a high energy fuel, and was costly to transport, it had to be used in the most efficient manner. Worthington Co was the American company which had developed the pump which Simpson manufactured under licence in Britain. Battye Library. Close up of an engine. The original pumps used to push the water uphill from Mundaring Weir to the Eastern Goldfields were shipped to Western Australia from England in 5000 boxes and crates. Reaching Fremantle was only part of their journey – from there they had to be railed to the eight pumping stations. It was a logistical challenge that the firm supplying the 3 500 tons of plant met with colour coding and letters. Tenders for the supply and installation of the pumping station engines and boilers were called for in April 1899 and again in October 1899. On 9 March 1900 the contract was signed and James Simpson and Co of London committed to erect and have all of the pumping machinery and boilers in full working order within 27 months, delivering equipment at two monthly intervals between July 1901 and June 1902. One duplex pump and a boiler were completed at each station in the first instance to allow pressure testing the pipeline as it was progressively completed. Simpson supplied 20 ‘pumping sets’ of Worthington Horizontal Duplex Triple Expansion High Duty Pumping Engines with their accompanying boilers, the only firm that agreed to supply the complete package of engine and boiler. Simpson had a license to build USA-designed Worthington pumps in England. Because of the contract’s tight timeframe, possibly half the pumps were built by a firm in Belgium that had the same licensing arrangement in that country. The first equipment to arrive at the new harbour of Freemantle consisted of ten ton travelling cranes, one for each of the eight pumping stations, for use in erecting the equipment. Richard Hartley, author of River of Steel, the history of the Goldfields and Agricultural Water Supply 1903 – 2003, suggests they were not used. Simpson came up with what Harley describes as ‘a very elegant and economical arrangement’. The tender document had specified the pumping performance required, allowing the manufacturer to decide the number of pumps and horsepower to achieve this. By this arrangement three pumps were installed at each of the first four pumping stations (two to be in operation at any one time, one on standby) while two pumps were installed at the other four (one in operation, one on standby). Each pump had a lift of 225 feet and 300 horsepower to achieve this lift. The steam ends of all 20 engines were the same. All pumping engines had: two 16 inch diameter High Pressure Cylinders, two 25 inch diameter Intermediate Pressure Cylinders and two 46 inch diameter Low Pressure Cylinders. The normal stroke of the pump plungers was 36 inches and the piston-speed 150 feet per minute. The only difference was in the size of the plungers – at Stations 1 – 4 two pumps could deliver 5.6 million gallons while one pump could deliver the same amount at Stations 5 -8. Hence the first 12 engines (three each in Stations 1 – 4) had 15 inch diameter plungers while the next eight (two each in Stations 5 – 8) had 21 inch diameter plungers. Such standardisation cut manufacturing costs and reduced the number of spare parts required. The 20 ‘groups’, each consisting of an engine and boiler to be distributed over 600 km of country, were each given a distinctive colour and letter and every part of the group was painted with its distinctive group colour. When the parts were cased, one end of the packing case was painted with the correct group colour. Parts from different groups were never packed in the same case. Each case was also marked with the group letter and numbered consecutively. Marks were duplicated – painted on the case or package as well as stamped on tabs fasted to them. By these simple precautions all trouble was avoided. The railway, shipping and wharf men were supplied with coloured group key plans, and so were able to pick out at once the various cases and packages belonging to each group and to send them on to their correct destination. This will be appreciated when we state there wee some 5,000 packages, and the only complaint received from the erection staff as to missing material referred to one ½ in. hydraulic valve. intermediate reheaters with steam at boiler pressure between the high pressure and intermediate pressure cylinders and again between the intermediate and low pressure cylinders. more than confirms the wisdom of the decision on the part of the West Australian authorities to select the Worthington design for their pumping machinery. Worthington refers to the engine being patented by the Worthington firm in the United States of America but for which James Simpson had a manufacturing license in the United Kingdom. Hence it is sometimes referred to as a Worthington-Simpson engine. Horizontal as opposed to vertical engines which were more common in steam ships and refers to the configuration. Duplex refers to the three cylinders on the left being duplicated by three cylinders on the right of the engine. Triple Expansion meaning high-pressure steam passes into the intermediate pressure cylinder and from that into the low-pressure cylinder as it expands (and loses pressure). High Duty refers to an attachment that delivered stored energy on the return stroke. In effect, it replaced the flywheel often seen on steam engines. The steam ends of the engines were all the same so that all 20 boilers and accessories could be made standard to save costs and reduce the number of spare parts required. The so-called ‘water ends’ of the engines had one difference – 12 had 15 inch plungers (those in Stations 1 – 4 inclusive) while eight had 21 inch plungers (Stations 5 – 8 inclusive). Otherwise all the pumping engines had: two 16 inch High Pressure Cylinders, two 25 inch Intermediate Pressure Cylinders and two 46 inch Low Pressure Cylinders. The difference in the size of the waterplungers was due to Stations 1 – 4 having three engines each with any two being in operation at any one time and the third on standby while Stations 5 – 8 had only two engines each, one in operation and one on standby. Stations 5 – 8 then had one engine to pump the same amount of water that two engines pumped at Stations 1 – 4. 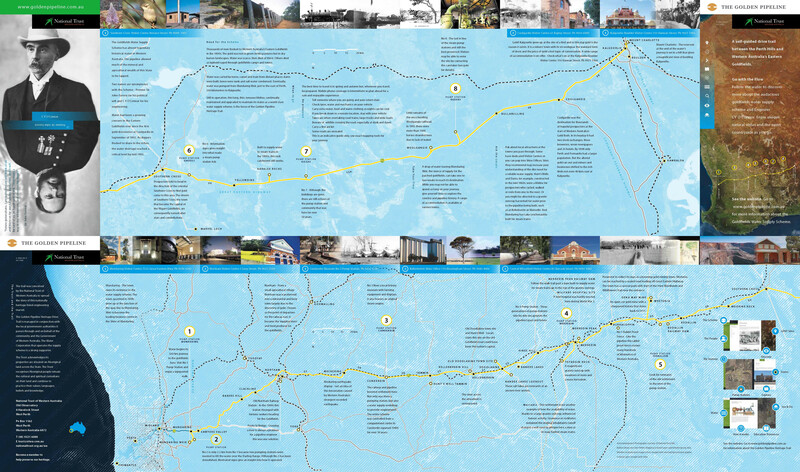 This was possible because after Merredin (No 4) the countryside gets flatter so height wasn’t such a consideration.